An ideal solution if you want to serve different beers at different gas pressures. In a typical multiple line, multiple pressure system you would run a gas line from you main regulator into a secondary regulator where you would set different pressures. While that is ideal it is a little pricey. This little sweetheart lets you set different pressures at a far lower cost. What we do is set the main regulator at the highest pressure we want in the system - for example a keg of soda that you want to carbonate and serve at 25 psi. 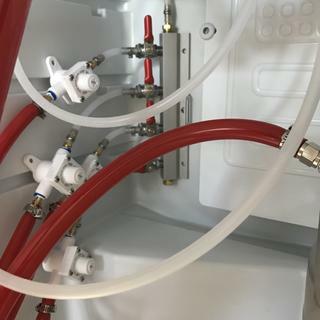 Run the gas line into a manifold and then install one of these after the manifold on each line where you want to decrease the pressure, for example lowering to 10psi to serve your British pale ale and 14 psi to serve your summertime lawnmower lager. 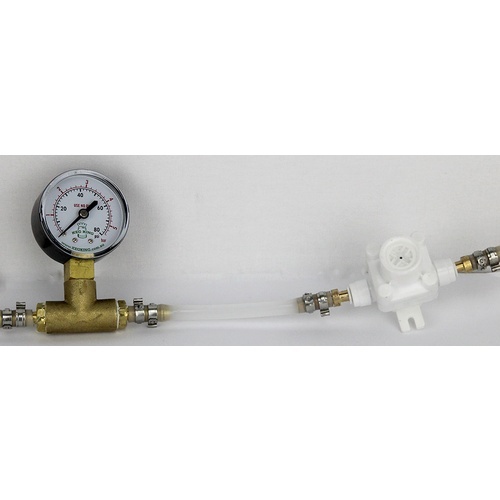 While this unit does not have a pressure gauge you can use an adjustable relief valve/spunding valve on your keg to tell the pressure. Pressure adjusments can be made with a screwdriver. The maximum inlet pressure is 150 psi. Made from non corrosive acetyl, nitrile, and stainless parts. The regulator comes with two brass barbs to fit 3/16" tubing on. 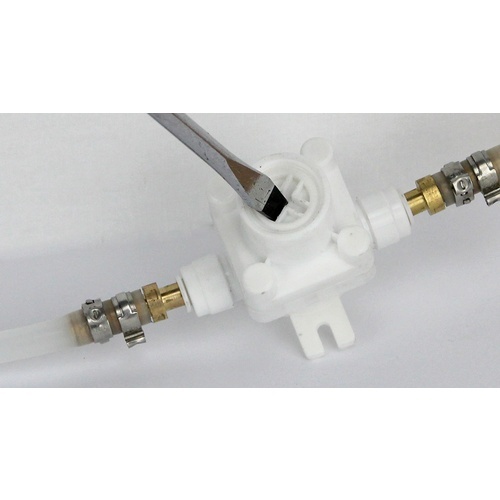 Alternatively, you can remove the barbs and use 1/4" tubing directly on the regulator. The aluminum manifolds linked above feature 1/4" barbed outlets and are a good match with this regulator. Can also be used with liquids. Decrease flow to pour draft soda. Multiple beer styles that Iâ€™d like to serve at different Carbonation levels. Check valves in gas system cause variable pressure drops plus some beers like a different pressure. 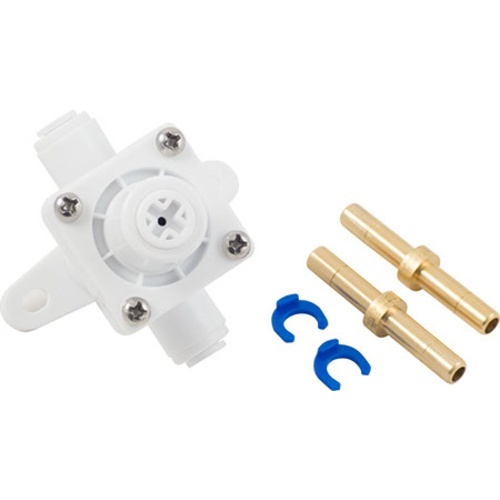 What part/connector do I need to buy in order to connect this to a cheap low pressure valve like D1088? Would 3/8" Barb x 1/4" Female Pipe work? 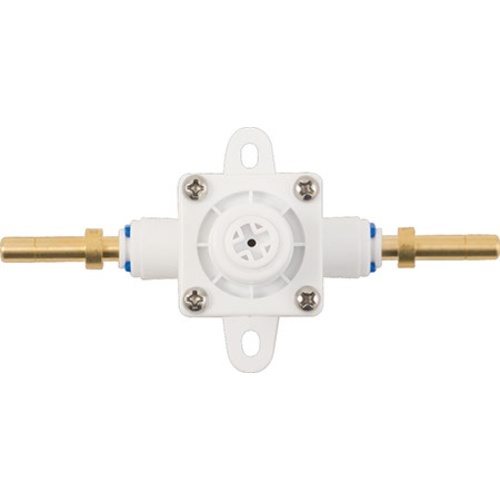 BEST ANSWER: Hi Jayson - We do not carry a "T Manifold Assembly" like in the picture for the D1045 but a D1820 with the 1/4" FPT should allow you to add the D1088 which would connect to the D1045. These took a bit of time to dial in and I still question how dialed in I really am. I use my spunding valve with 30psi dial to be able to set one valve at 25 for soda and water while having 3 other valves set to 8, 10, 12 for other beverages. So far I think it works well enough but I’ve only run 3 kegs through the system. I used the CO2 bottle holder bracket screw to hold my 4 valve manifold. The plan was to mount these valves to the wall with Velcro tape but the tape doesn’t stick the the valve due to low surface area contact. I think I’ll just let them hang as it will make removing them a bit easier if needed one day. Works perfectly. Yes a little goofy to use at times, requires a tad more work but the cost savings is worth it. Dialed my 4 kegs perfect at serving pressure while the 5th keg carbonated. Completely ineffective. Flow rate does not change at all when valve is turned. Plastic cracked after 5 minutes of adjustments.